Businesses which are at the ideas stage of a concept and which are looking to attract an entirely new selection of customers will have to come up with a comprehensive buyer persona. Those which are at the expansion stage will be looking to increase their following. To do this both types of business will have to decide the demographics of the people they wish to engage with. All of this information is great and it gives you a real feel for the types of people that you are targeting but you may find that you are still struggling against the competition that are pursuing the same individuals. If your business operates in the food and drink sector of the market and has a café in Greenwich, then you may want to target this individuals with a general blog post titled; ‘Ten best cafes in South London’. This general approach may raise some awareness and leaves the decision with the reader. For this reason, it is vital to make sure that your buyer persona is a detailed as possible. This is where psychographics come in. Demographics essentially tell you who the clients and customers are, yet psychographics will tell you why they make a purchase. Fundamentally, psychographics is the study and classification of people according to their attitudes, aspirations, and other psychological criteria, especially in market research. Things falling under the psychographic tag could be focus, social media preference, perception of quality, personality, political stance, newspaper of choice or values. If you take these into consideration and add them to the original you may find that your buyer persona looks something like this. When added together these two pieces of data help to build a clearer buyer persona and offer a more targeted approach when it comes to marketing, advertising and selling. If your business is a modern café in Greenwich that opens until midnight, plays some live music and serves craft beer in the evenings, then you could engage with this same user on Twitter, targeting them with a link titled, ‘Ten best, late night cafes in London’ or ‘Ten hidden music spots in South London’. The offering here is more bespoke and indeed enticing and could lead to further conversions. Obtaining answers to some of the secondary questions means that you may be able to further decipher buying factors. If the person who answered the questions above were a real client and you knew that their newspaper of choice was the Telegraph, then you should ask the question, who are the Telegraph’s readers? This could give you an insight in to other potential targets. In a similar vein, you could find more about a person through social media. If you were a health and fitness brand releasing a new range of healthy snacks you may want to better understand your market. Looking at similar items made by competitors or researching certain trends such as food and drink alongside health and well-being, you may end up finding a user on Pinterest. This person could be a female in her 20s with a focus on health and whose hobbies include cooking at home and yoga. The first part of this profile is the demographic; the later part is the psychographic. Together they form a larger buyer persona. Posts which might help her to engage and buy or download from your brand may cover topics such as the health benefits of your product, personal posts about people who have lost weight eating your product or people that use your produce as a healthy snack before a yoga/fitness class. These types of post are far more likely to resonate and be shared. 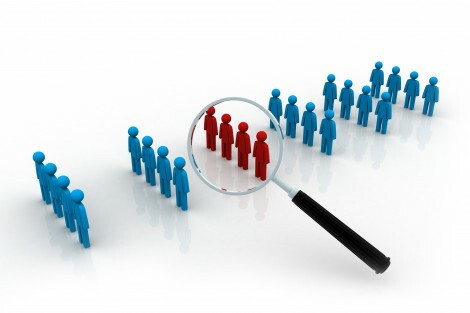 There are two popular methods of obtaining psychographics, the first is to interview or poll the current clients and customers that you have. Delving into this information can give you a picture of your current buyers and then lead you to targeting similar individuals. In an email marketing campaign, your inbound platform of choice will allow for market segmentation of the data and if you already know which people are visiting your website then you can target similar people with you campaigns. This is a personalised approach to a larger exercise and in theory should lead to a lower bounce rate ad higher open rate. The second route to generating your responses is through investigating your website analytics. Looking at what has made people connect, click or call in the past is a huge clue to why people are using your services. If a customer has responded to a particular call to action (CTA) this could be a clue to the type of person they are when interacting to a brand. If a visitor or the recipient of an email clicks on a link offering a big discount, this may mean they fit into the thrifty sector of the market, regardless of whether they believe they are a bargain hunter. If you gather enough of these types of people in your database or in your target market then it may be possible for you to re-engage with them further down the line. This use of psychographics and the understanding of what makes your customers tick can potentially lead to a higher conversion rate. 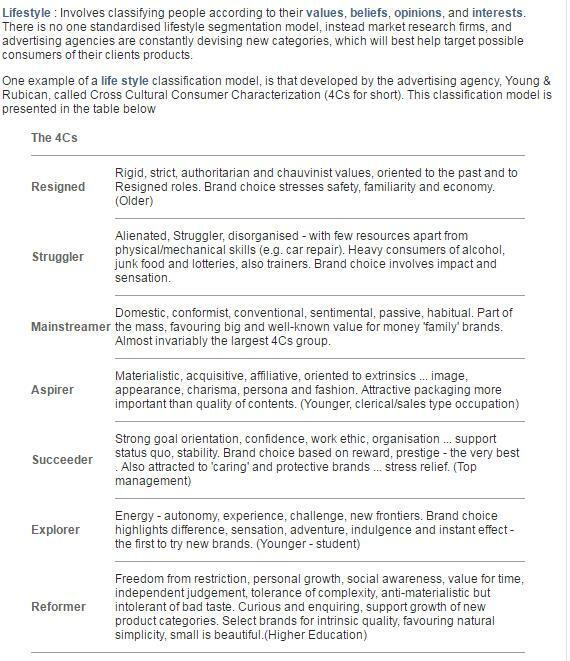 One of the best examples online come from the team at examstutor who produced the below image to highlight the 4Cs (Cross Cultural Consumer Characterisation). As we mentioned in our recent Drum supplement, personalisation is a key practice and can be the difference between standing out and not. By making sure that you conduct thorough research and that you relate your content to your findings you are giving yourself a higher chance of success. When it comes to targeting your audience your content must not only be relevant but must be distributed in the proper channels.